This T and O map, from the first printed version of Isidoor's Etymologiae, identifies the three known continents as populated by descendants of Sem (Shem), Iafeth (Japheth) and Cham (Ham). Japhetite (in adjective form Japhethitic or Japhetic) in Abrahamic religions is an obsolete historical term for the peoples supposedly descended from Japheth, one of the three sons of Noah in the Bible. The other two sons of Noah, Shem and Ham, are the eponymous ancestors of the Semites and the Hamites, respectively. 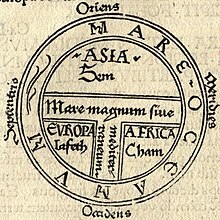 In medieval ethnography, the world was believed to have been divided into three large-scale racial groupings, corresponding to the three classical continents: the Semitic peoples of Asia, the Hamitic peoples of Africa and the Japhetic peoples of Europe. The term has been used in modern times as a designation in physical anthropology, ethnography and comparative linguistics. In anthropology, it was used in a racial sense for "white people" (the Caucasian race). In linguistics it was used as a term for the Indo-European languages. These uses are now mostly obsolete. In a linguistic sense, only the Semitic peoples form a well-defined family. The Indo-European group is no longer known as "Japhetite", and the Hamitic group is now recognized as paraphyletic within the Afro-Asiatic family. Among Muslim historians, Japheth is usually regarded as the ancestor of the Gog and Magog tribes, and, at times, of the Turks, Khazars, and Slavs. Josephus detailed the nations supposed to have descended from the seven sons of Japheth. Sons of Japheth: "Gomer, Magog, and Madai, Nidiazech, Tubal, Mocteras, Cenez, Riphath, and Thogorma, Elisa, Dessin, Cethin, Tudant." Sons of Gomer: Thelez, Lud, Deberlet. Sons of Magog: Cesse, Thipha, Pharuta, Ammiel, Phimei, Goloza, Samanach. Sons of Duden: Sallus, Phelucta Phallita. Sons of Tubal: Phanatonova, Eteva. Sons of Tyras: Maac, Tabel, Ballana, Samplameac, Elaz. Sons of Mellech: Amboradat, Urach, Bosara. Sons of Ascenez: Jubal, Zaraddana, Anac. Sons of Heri: Phuddet, Doad, Dephadzeat, Enoc. Sons of Togorma: Abiud, Saphath, Asapli, Zepthir. Sons of Elisa: Etzaac, Zenez, Mastisa, Rira. Sons of Zepti: Macziel, Temna, Aela, Phinon. Sons of Tessis: Meccul, Loon, Zelataban. Sons of Duodennin: Itheb, Beath, Phenech. Irish and Armeniano-Caucas have many different origins. Italy was populated by many peoples. The "Book of Jasher", a midrash (elaboration of the biblical text) first printed in 1625, ostensibly based on an earlier edition of 1552, provides some new names for Japheth's grandchildren. The term Caucasian as a racial label for Europeans derives in part from the assumption that the tribe of Japheth developed its distinctive racial characteristics in the Caucasus area, having migrated there from Mount Ararat before populating Europe. In the same vein, Georgian nationalist histories associated Japheth's sons with certain ancient tribes of the Caucasus area, called Tubals (Tabals, Tibarenoi in Greek) and Meshechs (Meshekhs/Mosokhs, Moschoi in Greek), who they claimed represented ancient pre-Indo-European and non-Semitic, possibly "Proto-Iberian", tribes of Asia Minor of the 3rd-1st millennia BC. This theory influenced the use of the term Japhetic in the linguistic theories of Nikolai Marr (see below). During the eighteenth and nineteenth centuries, the Biblical statement attributed to Noah that "God shall enlarge Japheth" (Genesis 9:27) was used by some preachers  as a justification for the "enlargement" of European territories through imperialism, which they interpreted as part of God's plan for the world. The subjugation of Africans was similarly justified by the curse of Ham. The term Japhetic was also applied by William Jones, Rasmus Rask and others to what is now known as the Indo-European language group. The term was used in a different sense by the Soviet linguist Nicholas Marr, in his Japhetic theory, which was intended to demonstrate that the languages of the Caucasus formed part of a once-widespread pre-Indo-European language group. ^ Parry, J. H. (ed.). "7:3". Book of Jasher. Translated by Moses, Samuel. ^ Parry, J. H. (ed.). "7:4". Book of Jasher. Translated by Moses, Samuel. ^ Parry, J. H. (ed.). "7:6". Book of Jasher. Translated by Moses, Samuel. ^ Parry, J. H. (ed.). "7:7". Book of Jasher. Translated by Moses, Samuel. ^ Parry, J. H. (ed.). "7:8". Book of Jasher. Translated by Moses, Samuel. ^ Parry, J. H. (ed.). "7:9". Book of Jasher. Translated by Moses, Samuel. Kidd, Colin (2006). The Forging of Races: Race and Scripture in the Protestant Atlantic World, 1600-2000. Cambridge University Press. ISBN 9781139457538. This page was last edited on 17 April 2019, at 09:27 (UTC).